Sports have been popular for both men and women. Women are now more visible in sports than at any point in history and are a huge contributor in the field of sports. Sports have the potential to empower women and young girls. Women in sport oppose the misconception that they are weak or incapable. Every time they succeed or kick a ball, demonstrating not only physical strength, but also leadership and strategic thinking, they take a step towards gender equality. Women’s participation in sports can help break down gender stereotypes, and improve girls’ and women’s self-esteem. “As a female athlete I support and encourage the fact that women are now a huge contributor to sports and Olympic games,” said Deandra McClinton, a member of Edison’s Track Team. Women are now far more visible in sports today than at any other point in history. “The Olympics of the modern era started as an all-male event, with women making gradual inroads to compete in different disciplines. As such, women competed for the first time at the 1900 Games in Paris. Of a total of 997 athletes, 22 women competed in five sports: tennis, sailing, croquet, equestrianism and golf. Incredibly enough, women were only allowed to run the marathon in the Olympics in 1988. Also, with the addition of women’s boxing to the Olympic programme, the 2012 Games in London were the first in which women competed in all the sports featured,” taken from UN Women- an organization dedicated to gender equality and women empowerment. Despite the participation of women in sports, the media’s attention towards women is extremely low compared to the men. This shows gender inequality which seems to still exists in the 21st century. 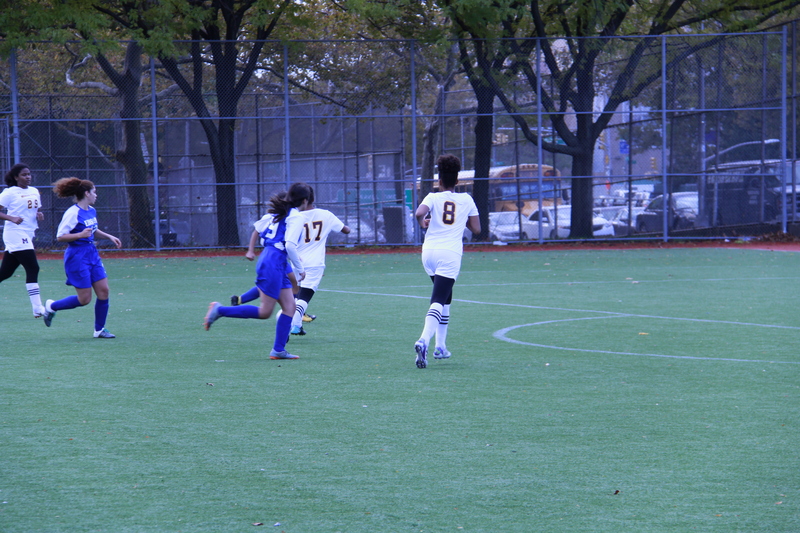 Caption: Edison’s girls soccer team playing in a final match. “Gender inequality still exists today because if you look at women soccer, they have to win a game to get paid but men get paid whether they win or not,” said Deandra McClinton. This actually negatively affects women’s salaries and the capacity to show their skills. “I love the fact that women are progressing day by day. They are getting recognition for playing sports whether be it for soccer or swimming. I am very proud to see that women are finally breaking the stereotype of being weak and incapable of doing anything,” said Ramsha Zuberi. More and more women are contributing to the world of sports today and have become an inspiration for young girl who are trying to pursue their dream of becoming an athlete. My name is Azmir Zahan. I write for the Sports section in the school’s online newspaper. From a young age, I was interested in sports. I love to watch sports especially soccer and basketball. My favorite teams are FC Barcelona, Real Madrid, Liverpool FC, Paris-Saint Germain FC and New York Knicks. I love trying new food, traveling and hanging out with my family and friends.